This entry was posted in Uncategorized on November 21, 2014 by Laurie Marion. The Board of Commissioners on November 18 accepted the request of the Developer (Arrowhead) to withdraw their application to rezone the Briarlake Forest for high-density construction. Following that event, the Briarlake Community Forest Alliance Board met to reflect on what we were able to achieve since Labor Day as a basis for our next steps. 1. The withdrawal of the cluster home rezoning application. If the proposed smaller lot (R-60) rezoning application had gone through, the proposed high-density cluster home development would have been inconsistent with the characteristics of all the surrounding neighborhoods. This request has been removed from the County’s active zoning agenda, at least for the time being. 2. The prevention of the use of public funds to enable high-density construction. 3. The finding that there was not a legally binding commitment given by DeKalb County for greenspace, a park or reserve. Therefore, the County did not renege on their legal commitments – there never were any. There was never a clear and transparent process about how County officials were operating to provide greenspace. Validation was obtained that the proposed rezoning was being sought without the existence of a legally binding commitment on the part of either the County or the developer to establish any public/green space that would accrue to the benefit of the community as a whole – not on one acre nor on six acres. No formal/written promise or commitment was issued by the county at any point, and no mechanism was ever outlined to anyone, that would govern the maintenance, upkeep, or safety of any such area over the long-term. 4. The organization of the 12 surrounding neighborhoods, giving us one voice. 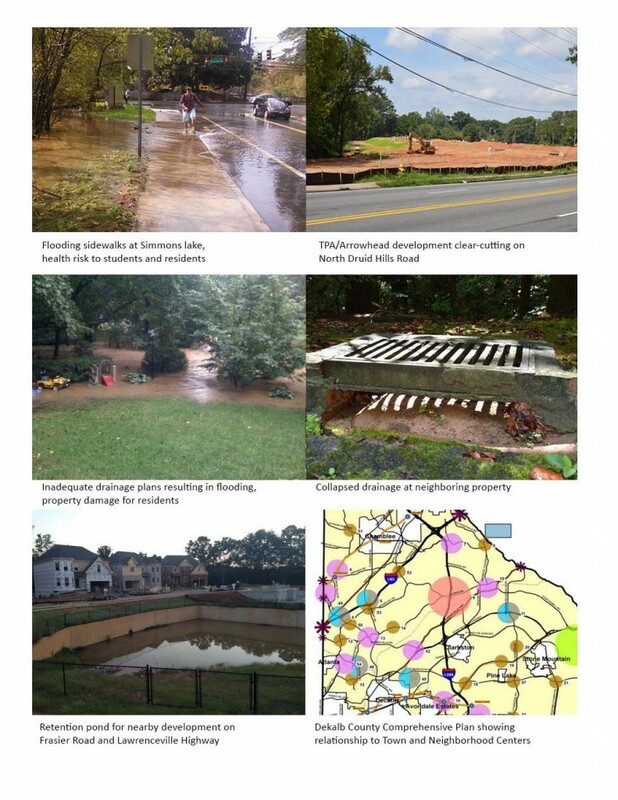 The residents of twelve neighborhoods in our area, many of which have historically maintained their own individual sense of community without the presence of formal homeowners’ associations, were given an opportunity to speak with one voice on a matter of historical importance, and were able as a result to make progress in penetrating the lack of transparency in actions taken by the County and the Board of Commissioners. 5. 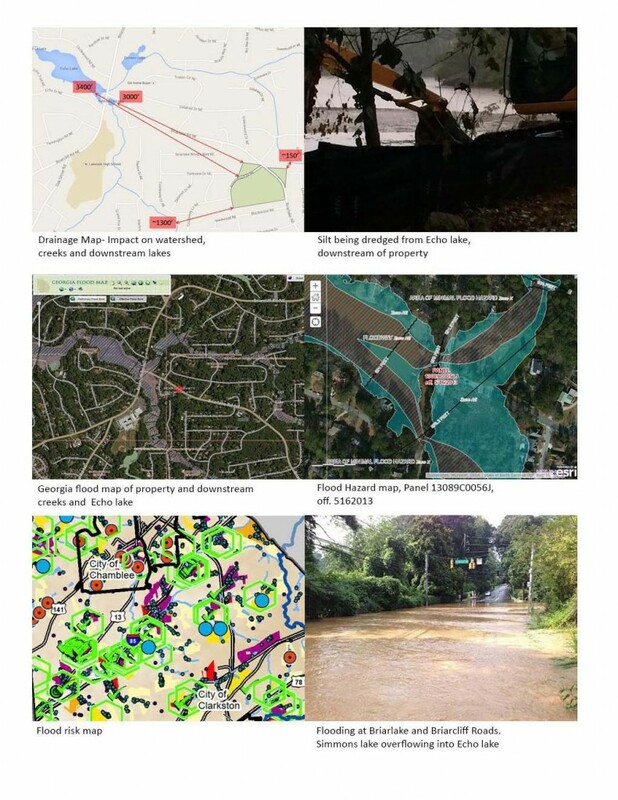 The research and documentation of the problems that ANY development will impose. Public safety, flooding, traffic, ecology, pollution, visual, legal, financial, etc. The potential problems that would be imposed on our community by additional development have been thoroughly researched and documented, and presented to County officials in a way that may have impacted their understanding of the situation. At a minimum, they can now better identify the issues and problems that concern our surrounding communities. 6. The establishment of connections with DeKalb County. 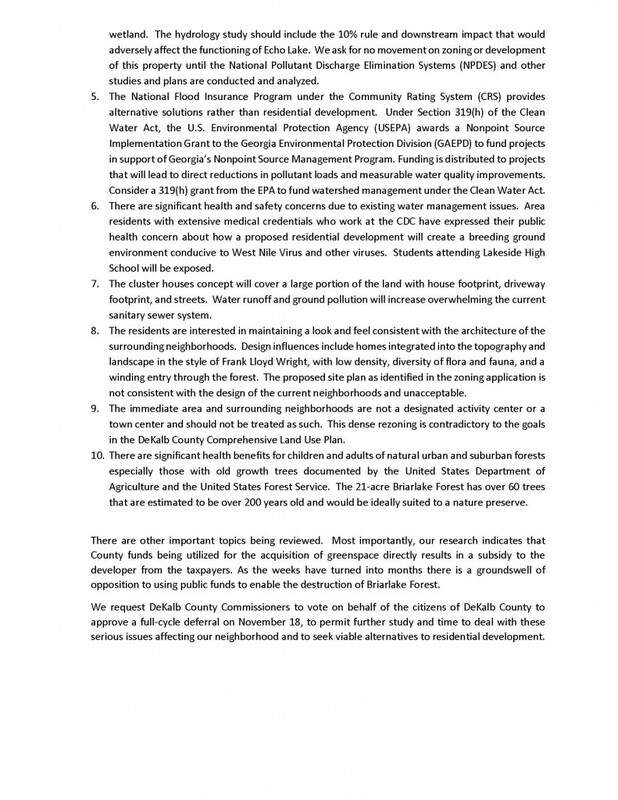 Open lines of communication were created with DeKalb County leadership, enabling the community to make them aware of the problems that any development would impose (and specifically what the impact of rezoning would be). Established extensive connections with other County, State, and Federal agencies. 7. The understanding we now have of the developer’s unexpected change of position – first asking for Deferral and later asking for a Withdrawal of their rezoning application – is that this change was not solely a result of our efforts. The decision by the developers to change their request at the Nov. 18 meeting from asking for a “Deferral” to formally “Withdrawing” their application for rezoning (on their own, without any signals from the County that it was likely to object to the specific land use) was not shared with us in advance of the Board of Commissioners meeting. This decision was impacted by residents’ concerns, but was mainly made either due (a) to the County’s inability/unwillingness to legally subsidize the developer, or (b) as a planned element of their negotiating strategy, which may suggest the possibility of alternative strategies being brought forth from them in the future. He is an expert in this type of transaction, hired to guide us through every move in the complex permitting process and the appeals making sure our needs are taken into account and the community has a strong voice. He will now play a pivotal role in advising BCFA in our legal options to protect the residents and reduce and/or limit residential development. He is conducting a similar role on behalf of the Druid Hills neighborhood opposing residential development in their area. 9. 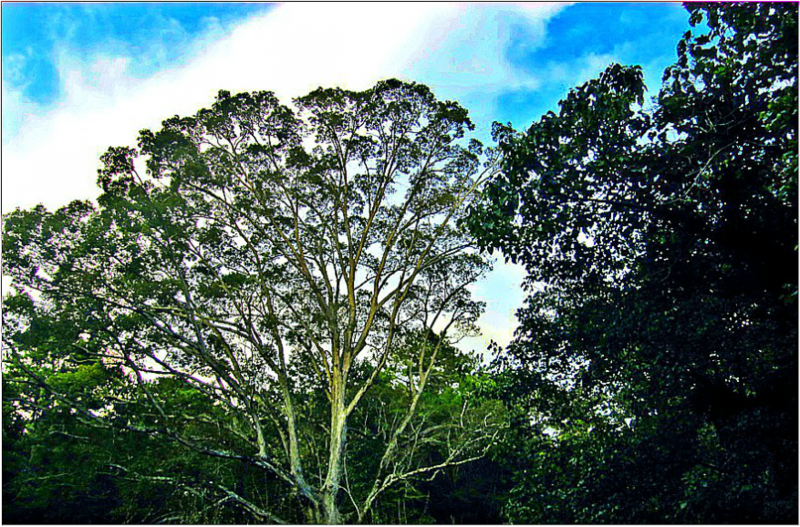 The identification of alternatives to development and potential funding. Alternative approaches to achieve the “highest and best use” of this valuable property continue to be developed, including sources of possible funding for any potential future transaction that might take place in that regard. 10. The solid proof that we are stronger together. It has been demonstrated that we are stronger when we act together, and therefore we must maintain our current posture and level of energy in order to successfully navigate the next steps in the process. We call on everyone to stay informed and to contact the County Commissioners to encourage them to work with the community to preserve all 21 acres. This entry was posted in Uncategorized on November 20, 2014 by Laurie Marion. The November 6 hearing of the Planning Commission was well attended by supporters of the Briarlake Community Forest Alliance. Most supporters wore green to show solidarity with our efforts to ensure a transparent process and oppose rezoning the property to R-NCD. Name badges with the BCFA seal were handed out and worn by many people in the audience. During the ten-minute period allowed for public comment, BCFA President Richard Marion spoke in opposition to the proposed rezoning. His speech outlined the community’s concerns including the major concern that the proposal has been presented to the community as including an agreement with the County to purchase some of the land for public greenspace. This would effectively amount to subsidizing the developer’s profits. Mr. Marion asked the Planning Commission to recommend a full cycle deferral so that the community could more fully understand the proposal and the environmental consequences of development. He also presented a written analysis of the proposal with regard to the DeKalb County Comprehensive Plan to the Planning Commission members. Following Mr. Marion’s speech, Echo Lake HOA Treasurer Ben Seibel spoke about the concerns of the Echo Lake community. 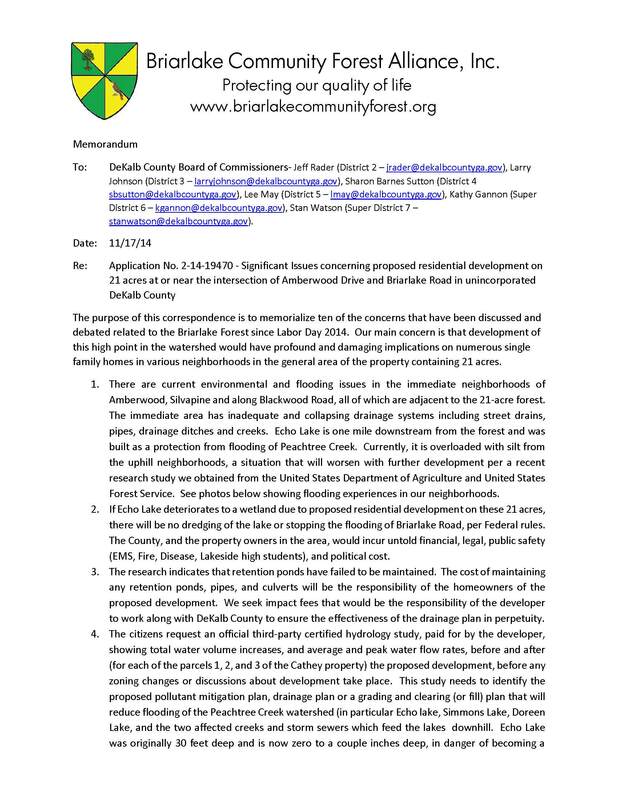 Referring to the iTree Hydro study that estimated a significant increase in runoff resulting from development, Mr. Seibel voiced the concern that development would cause heavy flooding at the intersection of Briarlake and Briarcliff Roads, presenting a life-threatening situation to pedestrians including Lakeside High School students. Further, the amount of silt that would be generated would make Echo Lake residents’ efforts to maintain the lake unsustainable. The time allotted for public comment ended with Mr. Seibel’s speech. Several more people had stood up to speak; the moderator told them they would have another opportunity at the Board of Commissioners hearing on November 18. After the public comments had ended, Planning Commissioner Jon West posed a number of questions to the developer’s attorney. A transcript of this discussion may be downloaded. First, Mr. Forsling said that TPA-Arrowhead is not interested in pursuing the R-NCD zoning if the county opts not to acquire the greenspace for park land. Of special interest are two comments made by Bryan Flint, vice president of Arrowhead Real Estate Partners. Mr. Flint said that “the property was looked at for park space before and had been purchased before” and that “we do this reducing value by reducing lot sizing so we’re trying to still create a development that is economically feasible.” According to what Mr. Flint said, the reduced lot size means a reduction in value of the property, presumably from the value it would have under the current R-100 zoning. Planning Commissioner West concluded the discussion with the comment that “this is going to need a lot more detail to show that . . . this is a benefit.” A motion was made to recommend a full cycle deferral, the motion was seconded, and the Planning Commission voted unanimously to recommend full cycle deferral of the rezoning proposal. The vote was greeted by enthusiastic applause from the citizens in the audience. BCFA volunteers handed out a sample letter to encourage citizens to write or call their County Commissioner. This entry was posted in News on November 14, 2014 by Laurie Marion. DeKalb group tries to stop development of forest. This entry was posted in News on November 3, 2014 by Laurie Marion.